Taipei, April 4, 2019 — From a modern summer villa with an outdoor pool to a fully equipped film studio or a casino, paper model makers in Taiwan are ensuring the dead enjoy an eternity of luxury. In recent years, traditional paper incarnations of money and gold bars have given way to the more modern — paper iPads and mobile phones, washing machines, cars, televisions and credit cards. “We believe that people will move on to another world after they die,” explained Taipei businessman Chen Shu-hsuan, as he attended his uncle’s funeral. Moments before, family members prayed as a detailed model of a two-story mansion created for the deceased went up in flames, complete with working lights, paper staff and a luxury car tucked away inside an attached garage. “We hope he would live a good afterlife in that world so we prepare a paper house and a lot of paper money so he could have the means to live well,” Chen said. Chen said his family intended to burn more offerings for his uncle on Friday’s Tomb Sweeping Festival when ethnic Chinese traditionally visit and tidy the graves of their ancestors to pay respect. 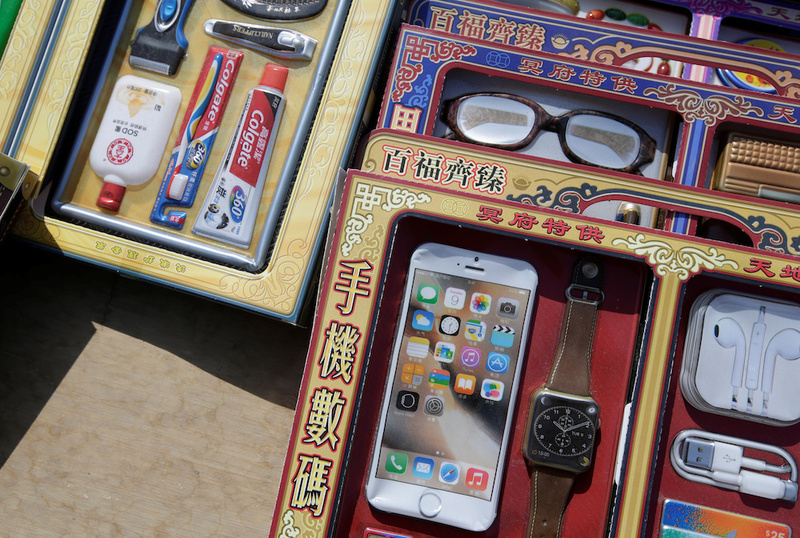 His most popular offerings include realistic miniature gadgets such as smartphones and laptops to a “mini vault” containing a wad of US dollars, gold bars and credit cards. Lin’s company is also one of a handful in Taipei that still manufacture bigger, traditional Chinese-styled houses made with paper and bamboo. But they fell out of fashion because of environmental concerns, as they used to contain styrofoam. “We are making changes to produce smaller and more intricate models to better suit the times. And using more environmentally friendly materials,” Lin said, adding that fewer than 20 per cent of his orders now are for traditional houses. “Some people think our business is ill luck because it has to do with the dead but I believe we are accumulating good karma for the services we provide,” he said. Han offers a variety of handcrafted everyday items such as paper clothes, bags and cosmetics priced from around US$100. She once built an elaborate film-studio boasting sets from different time periods for the family of a deceased entertainment tycoon. The bill came to US$64,000. The tradition has crossed over into Taiwan’s other faiths. Han estimates 20 per cent of her customers are Christian. She will display some of her designs at an exhibition on Taiwan’s funeral culture in Paris from June, including a dim sum restaurant based on a product she previously made for a customer.